Click here to view the box score from today's game. The first five innings of the game featured strong, scoreless pitching before Somerset broke though in the sixth on an Aharon Eggleston RBI single. 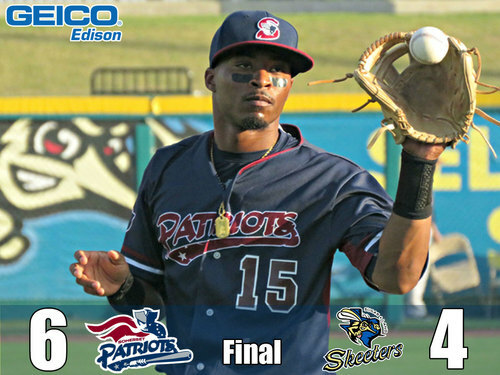 The Patriots tacked on to their lead one inning later with a five-run outburst. Scott Kelly began the big inning with an RBI double down the left field line. Justin Trapp then added an RBI single before stealing a pair of bases and coming home on an Eggleston sacrifice fly. Three batters later, after a pitching change, Kyle Roller (14) capped off the inning with a two-run home run to right-center field. The Skeeters began their comeback in the bottom of the seventh on a two-out RBI single from Dickie Thon. They then came within two runs in the eighth on an Anthony Giansanti RBI double and a Kevin Ahrens (9) two-run home run to left field. Sugar Land put the tying run on base in the ninth inning, but Ronnie Shaban forced Joe Benson to ground into a game-ending 6-4-3 double play to nailed down the save. A.J. Achter (2-0) earned the win after he allowed one run over a season-high 2.2 innings of relief. Sean Gleason (1-7) yielded one run over five-plus innings to take the loss. Shaba (7) earned the save with a scoreless ninth. Somerset concludes its six-game series in Sugar Land Wednesday night. Lucas Irvine (7-2, 3.60 ERA) takes the mound for the Patriots against Skeeters’ righty Mitch Talbot (5-2, 4.16 ERA). First pitch at Constellation Field is scheduled for 7:05 p.m. CT and 8:05 p.m. ET. Tickets to the 2017 Somerset Patriots Season presented by Ford, which includes the team’s 20th Anniversary, are on sale now. For more information, stop by the ballpark, call (908) 252-0700, or visit www.somersetpatriots.com.